Watercolour New Zealand’s 2012 annual exhibition, Diamond Jubilee ‘Splash’, to celebrate the 60 year reign of Her Majesty Queen Elizabeth II, was opened by the Governor-General, Lt Gen The Rt Hon Sir Jerry Mateparae, on October 12. Guest artists Nancy Tichborne, Sue Wickison and Susan Worthington all have connections with royal gardens at Kew or Highgrove. Paintings by Susan Worthington feature in The Highgrove Florilegium, a two-volume limited edition publication containing 124 watercolour paintings of plants and trees from the Highgrove garden of HRH The Prince of Wales. A copy of the Florilegium, valued at NZ$24,000, which has been loaned by London-based publisher, Addison Publications, was on display at the exhibition on opening night, Friday 12 October and again on Saturday 13 October, when Susan Worthington and celebrated New Zealand artist Nancy Tichborne gave talks. In addition to paintings of botanical and garden subjects by the guest artists, the exhibition showcased over 240 watercolours depicting a range of subjects in a variety of styles. From 12 noon to 2pm daily, visitors watched demonstrations of watercolour painting by well-known artists. The public also had the opportunity to attend outdoor painting sessions with local watercolour artists at Lady Norwood Rose Garden. The exhibition was held at Academy Galleries, Queens Wharf and was open to the public from 13-21 October. Diamond Jubilee ‘Splash’ shared the gallery space with Ceramicus12, the annual exhibition of the Wellington Potters’ Association. The exhibition season continued to hold excitement as we watched the sales rising steadily with 54 artworks sold. The daily demonstrations were very well attended. On Saturday 13 October we invited all visitors to a Royal High Tea of scones and jam and cucumber sandwiches during talks by the three guest artists. Impressed with the turnout we wondered if many had responded to the ‘Free Event’ listing we had scored in the Dominion Post that morning. But when asked the audiences named a wide range of sources from the Dominion Post, to the Otago Girls High School Old Girls network (supporting Nancy), articles on local artists in local newspapers, Susan Worthington’s interview on Radio New Zealand, members receiving Watercolour New Zealand newsletters, and through Academy emails to members ie the audience had been attracted by a wide range of media promotion. The Committee’s endeavours went beyond the exhibition itself and included requests to the Diamond Jubilee Office for opportunities for watercolourists to paint for HRH The Prince of Wales and The Duchess of Cornwall. This shared passion was recognized and three Watercolour New Zealand artists, Dan Reeve, Shirley Sutton and Jacky Pearson were painting en plein air at Frank Kitts Park during the Royal walkabout on the Wellington waterfront on November 14. Government House has also agreed to allow an MPG to be held in the gardens on 24 February 2013. Details of this event are on page 8. As members you embraced the Diamond Jubilee as a special celebration and a record number of 127 artists submitted over 300 artworks from all over New Zealand. The concept of one third of the artworks being couriered to and from the exhibition was staggering. It added an extra item to the workload to be planned for. On Collection day a team of 15 members packed 34 consignments. A special thanks to Creative New Zealand for funding, also to The French Art Shop for its People’s Choice award won by Jimmy Chen for his painting ‘Hat Man’, Gordon Harris and Addison Publications of London for their support. As the Event leader I would like to add my personal thanks to the following special people:- Dianne Taylor, Martin Jenkins, Nigel Frith and guest artists Nancy, Sue and Susan - who all shared the dream with me from February 6, Waitangi Day, when the Queen's Diamond Jubilee was formally announced by the Governor-General. My special thanks to my husband Tom who let the housework be overlooked for 8 months and to all the committee and volunteers who supported this event. E kui mā, e koro mā, e huihui nei, tēnei aku mihi māhana ki a koutou. Kia ora tātou katoa. Ladies and gentlemen, warm greetings to you all. I specifically acknowledge: Helen Wilson, President of Watercolour New Zealand and vice-presidents Claire Clark and Martin Jenkins; guest artists Nancy Tichborne, Sue Wickison and Susan Worthington; Ambassadors and High Commissioners and members of the Diplomatic Corps — tēnā koutou katoa. 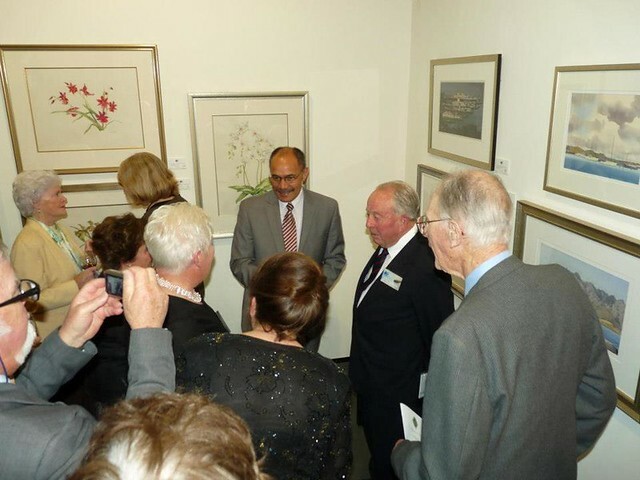 Thank you for inviting me to the opening of Watercolour New Zealand’s Diamond Jubilee Exhibition. Naturally, the Diamond Jubilee has featured strongly in our lives this year, particularly with the celebrations around the Queen’s Birthday in June, followed by the amazing spectacle of the Olympic Games. And I note that a certain accomplished and published watercolourist – His Royal Highness the Prince of Wales – will shortly be visiting New Zealand along with Her Royal Highness the Duchess of Cornwall, to mark the Diamond Jubilee of Her Majesty, Queen Elizabeth II, the Queen of New Zealand. Prince Charles and the Duchess of Cornwall will have a pretty full agenda while they are in New Zealand. I’m doubtful of the Prince having an opportunity to produce any watercolours of the gardens at Government House. But you never know! I’m told that one of the advantages of watercolour painting is that it can often be done very quickly, and almost on the move. Let me say from the outset, my “talent” is more appreciating art, not creating it. I know what I like and watercolour art has appeal. Also though, I’m influenced by the art I’ve grown up with, and my comments tonight will show that! Some of the best watercolour work done by New Zealanders has been done literally at the front during wars. The work of Horace Moore-Jones during the Gallipoli Campaign is a prime example. Reading Christopher Pugsley’s Gallipoli: The New Zealand Story and other accounts, it is clear that there was nowhere New Zealand soldiers were really safe from enemy fire – except for a narrow strip under the cliffs on Anzac Cove. So it is remarkable to think that Moore-Jones did any of his pencil and watercolour sketches – let alone a work like ‘The Man with the Donkey’. That piece of art has been lodged in the national memory for the almost-one hundred years since then. Moore-Jones was a ‘soldier-artist’. It was not until almost the end of the war that the government appointed official artists on the Western Front. War artists had a much bigger role in the Second World War and especially with the 2nd New Zealand Expeditionary Force – one of the best known being Peter McIntyre. We are lucky enough at Government House to have a watercolour of the House by Sir Peter McIntyre. It is on loan from a former resident, George Fergusson, now Sir George Fergusson and Governor of Bermuda, who was just a boy when his father, was appointed Governor-General in 1962. I might also mention here that we have another watercolour of the house by another accomplished watercolourist – Mary Zohrab, Lady Mary Hardie-Boys, the wife of my predecessor Sir Michael Hardie Boys. I understand Mary had much to do with your group! But speaking of war artists of the Second World War – the Watercolour New Zealand counts a prominent one among its current membership – and that is Robin Kay, who I believe is with us here tonight. Robin Kay’s wartime paintings are evidence that watercolour is the perfect medium for recording not only the facts, but the feel, of history. One of Robin’s paintings has the unromantic title of: ‘View to the South East of the Kaponga Fortress, El Alamein’. It is a small watercolour – but it certainly gives you the feel of the place – the desert, the clouds, the rusting vehicle half buried by sand. A photograph, or even an oil painting, could not do the same job of providing the atmosphere. I am keenly aware that the 70th anniversary of the Battle of El Alamein will be commemorated later this month. Bearing in mind those seven decades between then and now, I would like to take this opportunity to pay tribute to Robin Kay for his war art, his later war history writing and his more recent art work – for which, I note, he won a Governor-General’s Award at the New Zealand Academy of Fine Arts five years ago. I would also like to pay tribute to Claire Clark for the work she has put in to organising tonight’s show. I am told Claire began the “Splash” exhibitions in 2006 – and that these events have since become a major feature of the Watercolour New Zealand calendar. And with those points made, all that is left for me to do is to declare the Diamond Jubilee ‘Splash’ 2012 exhibition of Watercolour New Zealand open - and wish the society all the best for the future. Kia ora huihui tātou katoa.